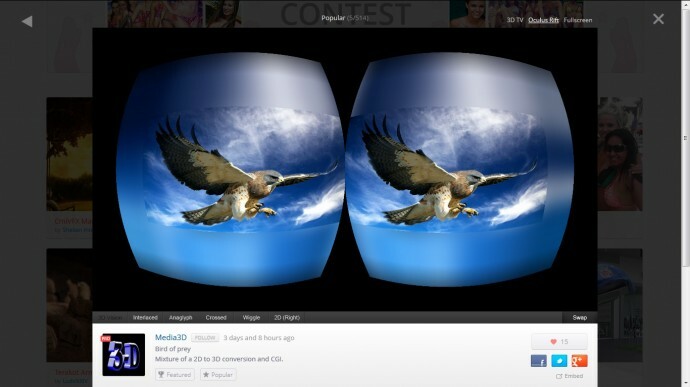 About a week ago the stereoscopic 3D photo sharing service Phereo announced beta support for viewing photos with the Oculus Rift 3D HMD, but initially it did not include the proper distortion of the stereoscopic 3D images that is needed to compensate for the lenses in the Rift. The good news is that Phereo continued to improve their Oculus Rift support and they added the lens distortion in order to make the 3D photos look properly when viewed through the HMD device. Furthermore in order to compensate for the chance that you may see black edges around the top and bottom of some images with wider aspect ratio they have also added what they call ambient light background in order to make the transition at the edges of the photos more seamless. So you should definitely check out the Oculus Rift support on the Phereo website if you happen to have a Dev Kit, some 3D photos shared there do look great now when viewed through the Rfit. Of course there is more to be done, like for example a bit of improvement around the center of the image where the left and rigth views of the stereo 3D photos connect. Apparently the Oculus Rift mode has been optimized for the A set of lenses for the Oculus Rift and while this works quite Ok with them, if you use the B or C set of lenses the right part of the left view and the left part of the right view gets “cropped” more from what you see so that some objects on the scene could be cut where they are not supposed to be cut (especially for things that pop-out). But as already mentioned the Oculus Rift support available on Phereo is still in Beta stage and we are already seeing good improvement.